It’s Friday night and we are just sitting back and relaxing with our liquid liberation! 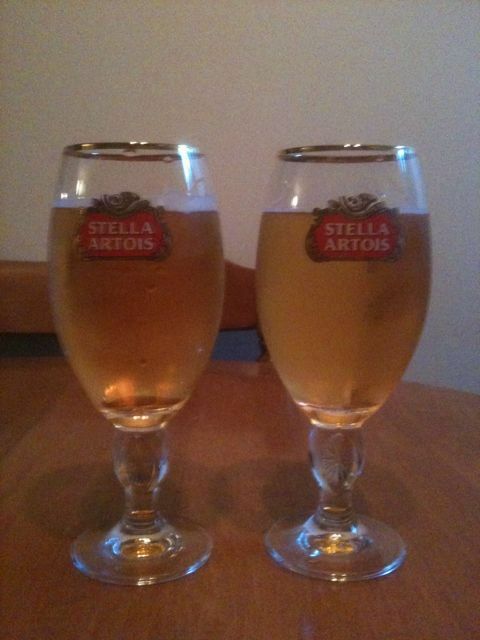 These glasses, filled with Stella Artois, are currently available at the LCBO; and, since this is one of our favorite beers we could not resist buying two gift boxes, each containing a glass and a bottle of beer. An interesting thing to note, the beer tastes just that much better when drank from these glass … are you as thirsty as I am? Posted in Musings and tagged Edward Caissie, Terri Caissie. Use this permalink for a bookmark.